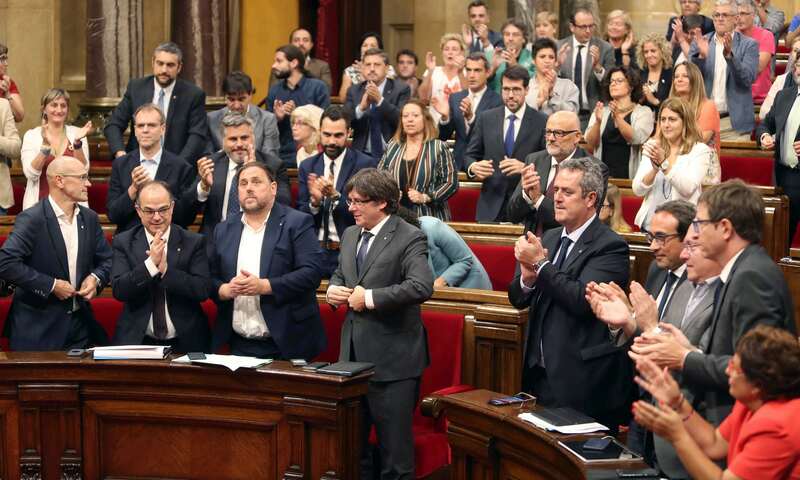 Here are two pictures from the Catalan Parliament yesterday. The first shows one side of the chamber rising to its feet to applaud the vote to hold a binding referendum on independence on 1 October. From a different angle, the second shows what three of the opposition parties thought about it. They left just before the vote took place. Walk outs aren't uncommon in politics. And even if the PP, PSC and Cs had all stayed and voted against, it wouldn't have made the slightest difference to the outcome of the vote. 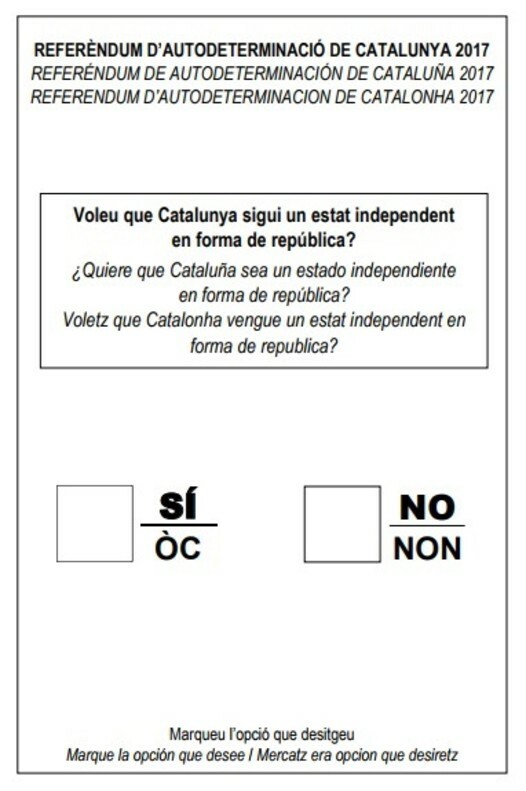 This is the ballot paper, which asks "Do you want Catalunya to be an independent state in the form of a republic?" So what happens next? 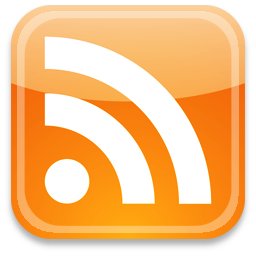 The ball is in the Spanish Government's court. Of course they will denounce the vote, call it illegal, and get the Constitutional Court in Madrid to confirm their opinion. That's what they do every time ... and, just as every time before, the Catalan Government will take no notice and go ahead anyway. They have their own mandate from the 2015 election. The real question is what the Spanish Government will do after that. If they try and arrest any politicians or public officials, they risk inflaming public opinion, resulting in more people being more determined to vote in the referendum. So I doubt that they'll do any more than issue warrants. They dare not attempt to enforce them. Catalunya's National Day is on 11 September, only a few days away, so we can expect a couple of million people on the streets of Barcelona, most of whom will be carrying flags and banners supporting independence – just as has happened every year for the past five years or more. The only thing that might spoil the party is the very real threat of another terrorist attack. 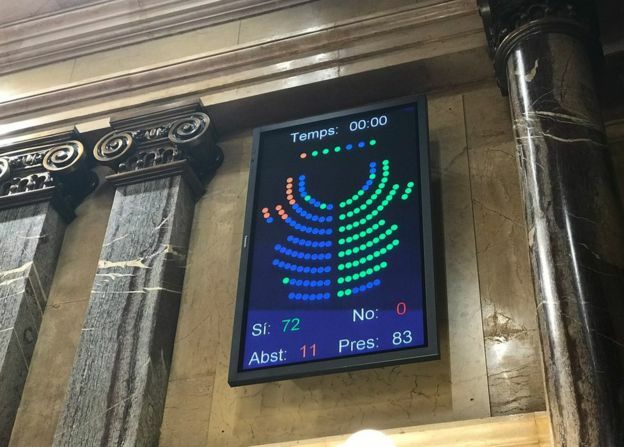 So my guess is that the Spanish Government will leave it until the day of the vote. A lot will depend on the anticipated turnout. If it looks like being low, they will probably decide it is best to do nothing, and claim that the result is invalid because most people in Catalunya didn't vote. But if it is clear that a majority will vote, they will then either try and stop people voting, or try and seize the ballot boxes after people have voted. A few isolated incidents of disruption are almost certain to happen somewhere, though probably not by people in uniform. 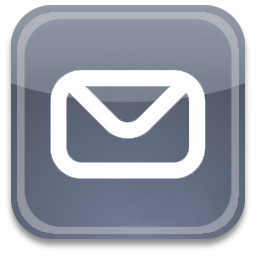 If the disruption is organized and systematic, implemented either by the military or by the Spanish Guardia Civil (the police force in Catalonia, the Mossos d'Esquadra, is answerable to the Catalan authorities) then the Catalan government will declare independence anyway on the basis of their majority in Parliament. I think the Spanish authorities would be well advised not to try this. They are currently telling the media that this referendum is undemocratic, so they will look pretty stupid on the international stage if they are seen to either prevent people from voting or prevent their votes from being counted. Their best bet is to ignore the vote, and hope that the rest of the world ignores it too. 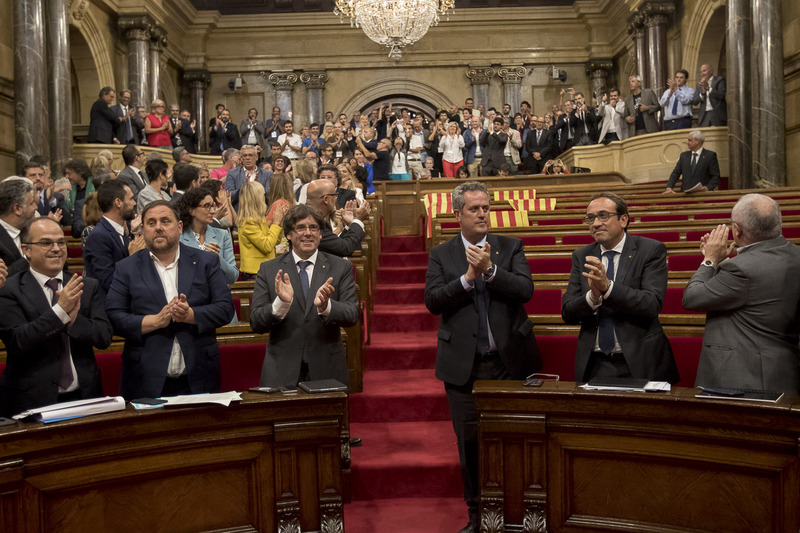 From the perspective of the Catalan Government, therefore, the only thing that will prevent them making a unilateral declaration of independence is if the result of the referendum is No. I don't think there is any political commentator who believes the vote will be anything other than a Yes. There's room for disagreement over the margin of victory and the turnout, but—provided the vote is not systematically disrupted by Spain—the result will be a Yes. We must therefore prepare ourselves for an inevitable declaration of independence in the first week of October. The EU and the rest of the world will not be able to sit on the fence any longer. But it really won't matter too much what the rest of the world thinks. The only question is whether Catalunya can operate as an independent state. The most critical institution for Catalunya to function as a independent state is now in place. After a few years of preparation, the new Catalan Tax Agency was set up only last week, so they are now able to collect taxes for themselves. Madrid will not be able to fiscally strangle an independent Catalunya by depriving it of the funds necessary for it to pay its police, teachers and the whole host of other public sector employees necessary for a state to operate. Spain might try and close its border with Catalunya, but Catalunya will still have a land border with France, and it has its ports and airports. I have no doubt that things will be tough for a while ... but I doubt that it will be any tougher than life will be for people in the UK if and when it leaves the EU. So what's left for Spain to do? Use their army to invade with troops and tanks? Use their navy to blockade the ports? Use their air force to bomb the airport runways? I'm sure Franco wouldn't have hesitated for a moment, but that was forty years ago, and western Europe is a completely different place today.